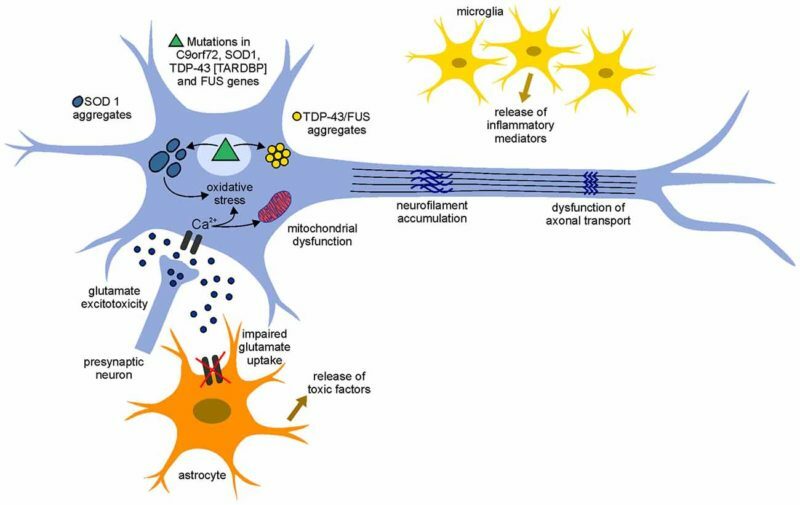 ALS Research Forum | Could Dipeptide Repeat Proteins Explain Selective Vulnerability in C9orf72 ALS? A new report may explain why repeat expansions in the C9orf72 gene may make motor neurons more vulnerable to ALS. The study, led by Shanghai Institutes for Biological Sciences’ Jin Xu in China, found that production of arginine-rich dipeptide repeat proteins, similar to those synthesized from these expanded sequences, in the fruit fly selectively led to the loss of glutamatergic neurons including motor neurons. No neurotoxicity in dopaminergic, cholinergic or GABAergic neurons could be detected. The report comes on the heels of two studies, led by University of Edinburgh’s Siddhartan Chandran in Scotland and University of Southern California’s Justin Ichida, which found that motor neurons derived from people with C9orf72 ALS are more susceptible to glutamate-mediated excitotoxicity (see February 2018 news; Selvaraj et al., 2018; Shi et al., 2018). The study appeared on July 23 in the Journal of Neuroscience. The results build on previous studies, from Steven McKnight and colleagues at the University of Texas Southwestern, which suggest that astrocytes may be less able to reduce toxic levels of glutamate in motor neurons in C9orf72 ALS due to arginine-rich dipeptide repeat proteins which interfere with splicing of EAAT2 transporter RNAs (see August 2014 news; Kwon et al., 2014; see also Lin et al., 1998). Together, the results add to growing evidence that dipeptide repeat proteins contribute to neurotoxicity in C9orf72 ALS and reducing them, may help protect motor neurons against the disease (see October 2017 news; June 2018 news). Xu W, Xu J. C9orf72 dipeptide repeats cause selective neurodegeneration and cell-autonomous excitotoxicity in Drosophila glutamatergic neurons. J Neurosci. 2018 Jul 23. pii: 0908-18. [PubMed]. Selvaraj BT, Livesey MR, Zhao C, Gregory JM, James OT, Cleary EM, Chouhan AK, Gane AB, Perkins EM, Dando O, Lillico SG, Lee YB, Nishimura AL, Poreci U, Thankamony S, Pray M, Vasistha NA, Magnani D, Borooah S, Burr K, Story D, McCampbell A, Shaw CE, Kind PC, Aitman TJ, Whitelaw CBA, Wilmut I, Smith C, Miles GB, Hardingham GE, Wyllie DJA, Chandran S. C9ORF72 repeat expansion causes vulnerability of motor neurons to Ca2+-permeable AMPA receptor-mediated excitotoxicity. Nat Commun. 2018 Jan 24;9(1):347. [PubMed]. Shi Y, Lin S, Staats KA, Li Y, Chang WH, Hung ST, Hendricks E, Linares GR, Wang Y, Son EY, Wen X, Kisler K, Wilkinson B, Menendez L, Sugawara T, Woolwine P, Huang M, Cowan MJ, Ge B, Koutsodendris N, Sandor KP, Komberg J, Vangoor VR, Senthilkumar K, Hennes V, Seah C, Nelson AR, Cheng TY, Lee SJ, August PR, Chen JA, Wisniewski N, Hanson-Smith V, Belgard TG, Zhang A, Coba M, Grunseich C, Ward ME, van den Berg LH, Pasterkamp RJ, Trotti D, Zlokovic BV, Ichida JK. Haploinsufficiency leads to neurodegeneration in C9ORF72 ALS/FTD human induced motor neurons. Nat Med. 2018 Mar;24(3):313-325. [PubMed]. Kwon I, Xiang S, Kato M, Wu L, Theodoropoulos P, Wang T, Kim J, Yun J, Xie Y, McKnight SL. Poly-dipeptides encoded by the C9orf72 repeats bind nucleoli, impede RNA biogenesis, and kill cells. Science. 2014 Sep 5;345(6201):1139-45. [PubMed]. Lin CL, Bristol LA, Jin L, Dykes-Hoberg M, Crawford T, Clawson L, Rothstein JD. 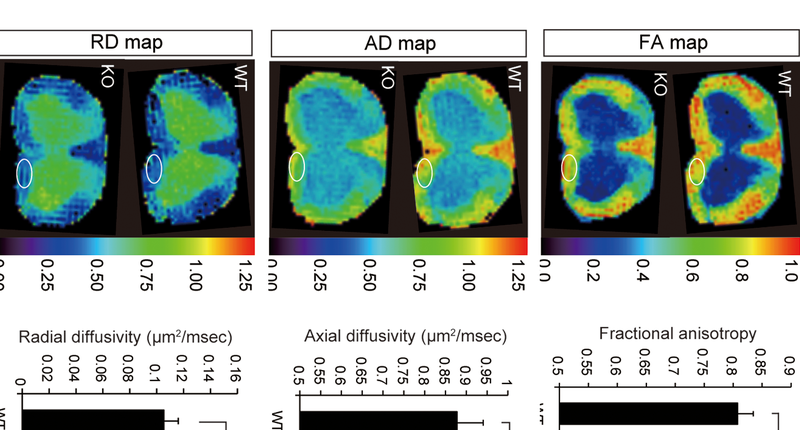 Aberrant RNA processing in a neurodegenerative disease: the cause for absent EAAT2, a glutamate transporter, in amyotrophic lateral sclerosis. Neuron. 1998 Mar;20(3):589-602. [PubMed].